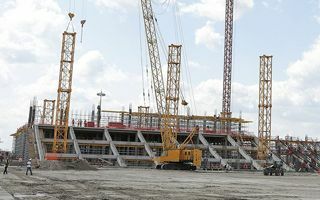 The new stadium in Rostov-on-Don was at the brink of being too late already in planning phase. After preparatory works began in 2012, there was barely any progress as redesigning works were carried out. We already wrote about how immensely different the updated stadium is from the early design. We also wrote how unsatisfying the cost-cutting was as the project went from RUB 20.2 billion to some 18.5 billion. But the price tag may still vary in the final outcome as Russia’s economy continues to be unstable. Also, with projects of this scale, amending the budget shouldn’t be too surprising as majority of works is still to be carried out. The phrase “majority of works” doesn’t give justice to how fast this stadium has been growing in recent months. Just compare photos from January and July. Which, by the way, are presented to you thanks to the help of Privet-Rostov.ru and the Rostov Governor’s Office! Fast progress comes as no surprise when you count how many people are working on the stadium. 2,500 workers in three shifts work around the clock, using over 80 machines. And remember, the stadium was redesigned in a way to facilitate construction, so changes are rapid. In fact, the building is already 32% ready and half of the entire concrete volume (92,000 cubic meters) was poured already to create the superstructure. The stadium is being built on the southern bank of Don, so called left bank (thus the unofficial name Stadion LevBerDon, from Russian words for Left Bank of Don). Eventual capacity is expected to be around 45,000, of which 5,000 is to be temporary. The entire stadium, including outer wrap, multimedia screen incorporated into the façade and other facilities are expected to be ready in December 2017.